This will be the cover of the new album. It was revealed on Ronan's official site. At least it has moved up in the Amazon sales rank... the other day its rank was something like 10,000 in Music and it is no. 109 right now. Chaos are offering a "CD/DVD Pack"......No details yet but sounds interesting?! Yes it would have to be that, and it would hopefully mean it is a bit longer than just a few minutes. Thanks for the link, what does he say about the album, and about movies? I don't want to subject myself to boyband talk. He doesn't really mention BZ only to say he was about to go on stage. Go listen its a nice listen. Thank you. I might check it out tonight. We would like to inform you that the version of When Ronan Met Burt by Ronan Keating does not exist and was listed in error on our site. I can confirm for you that there is no CD/DVD version for this title available with the supplier. Ronan talking about the Album - great interview. Also talks about the film too. 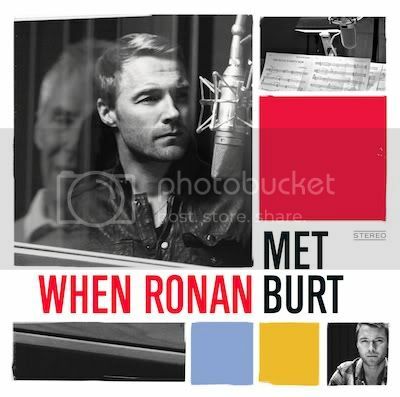 When Ronan Met Burt - http://bit.ly/gmCb5a Scroll down the page to view. ahh <3 thanks for that link. As much as I am really pissed off with the complete lack of publicity, and just about everything else... he is amazing. You can listen to a clip of each track on Amazon Germany now.